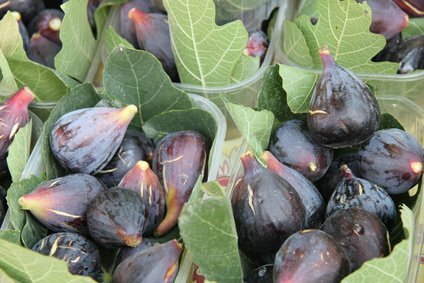 Figs originally came from the middle east, but there are many varieties and they can be grown in many areas of the United States. Fig trees need about eight hours a day of sunlight. Two thousand years ago, figs got a bad rap. Rumors circulated that Livia, the wife of Augustus Cesar, killed her husband by poisoning fresh figs still on the tree. He had become nervous about attempts on his life and would only eat unhandled fruit. Although my neighbors had a fig tree in their yard, as a youngster I never saw them eat one. To me figs were delivered via Nabisco Fig Newtons. Now I have two friends (Vickie and TJ) who have several fig trees in their back yard and if you stop over to see them at fig picking time, you're likely to end up with a brown bag filled with ripe figs. Fresh figs are delicious. You can eat them right off the tree or slice them and serve them in salads and other dishes. One of my favorite appetizers is to serve them on warm whole grain toast with goat cheese, salami, and parsley or cilantro. Add some caramelized onions and it's a ticket to food heaven. 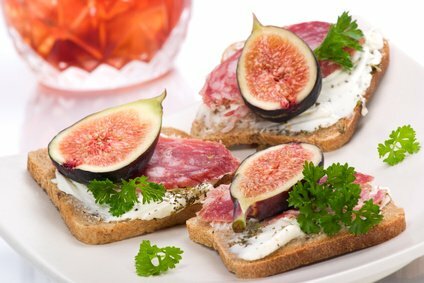 A simple appetizer is to spread fig butter (or jam) on flat bread, put a few crumbs of goat or gorgonzola cheese on top and broil quickly to just brown the cheese. Yummers! Some people complain of a sore mouth after eating fresh figs but that probably means they figs were picked before they were ripe. If a fig isn't ripe, snapping it off from the limb results in a latex-like enzyme oozing out from the stem. This can cause a minor irritation. It's best to wait until the figs are soft, ripe and easily come off the stem. Personally, I like dried figs. I can get a box of them (Mission brand) from a local convenience/drug store for about $1.25. Each box (4.25 oz.) contains three 1/4 cup servings at about 110 calories per serving. There are no fat or cholesterol and no sodium, but each serving delivers potassium, dietary fiber, iron, and calcium. 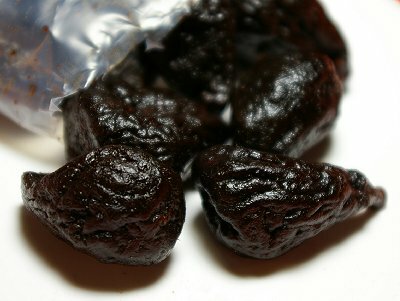 I'll eat the whole box as a snack, but even if you only finished half a cup of the dried figs you will benefit greatly. Healthy adult women need 21 to 25 g of fiber a day. Adult men need 30 to 38 g of fiber a day. A 1/2-cup serving of dried figs contains 7.3 g of fiber. People over the age of 50 or so need 8 mg of iron a day. A 1/2-cup serving of dried figs delivers 1.5 mg of iron. The American Heart Association recommends a healthy diet containing 4,700 mg of potassium a day delivered via natural foods. A 1/2-cup serving of dried figs has 507 mg of potassium. The Linus Pauling Institute mentions the need for potassium in connection with lowering blood pressure, "A number of studies indicate that groups with relatively high dietary potassium intakes have lower blood pressures than comparable groups with relatively low potassium intakes. 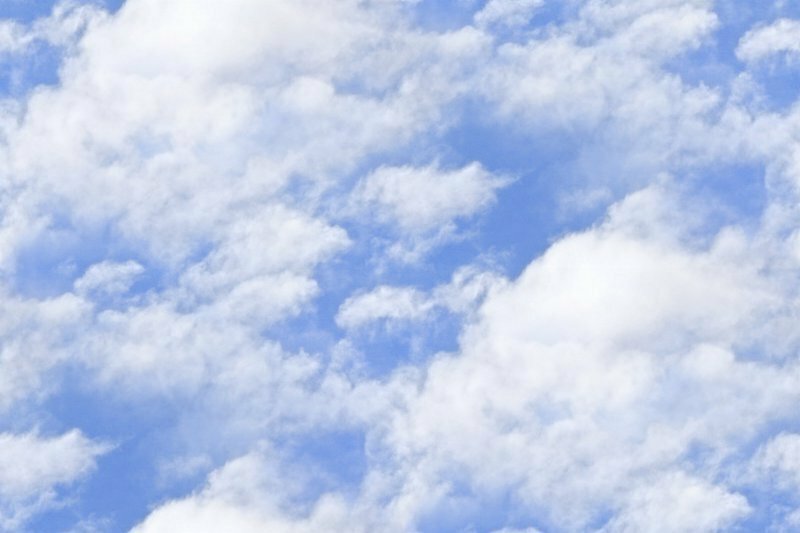 Data on more than 17,000 adults who participated in the Third National Health and Nutrition Examination Survey (NHANES III) indicated that higher dietary potassium intakes were associated with significantly lower blood pressures." Eating suggestion: try cut up dried figs in your porridge for the double benefits of whole grains and figs, one of thesuperfoods. 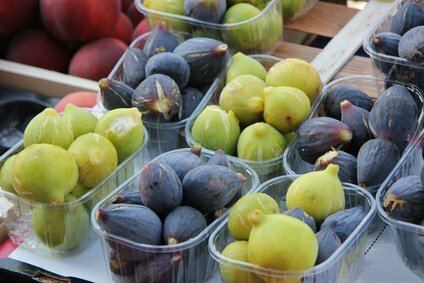 In upscale markets you can sometimes find fig preserves or if you are really lucky you might be able to find fig and walnut jam. 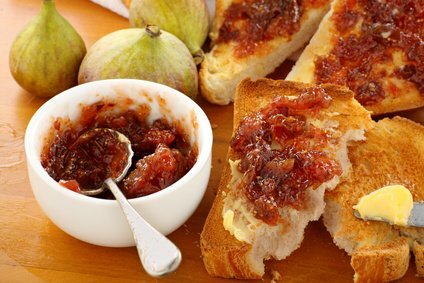 Fig jam is fantastic on homemade biscuits (I like my biscuits large and thick) or on whole grain toast. In an effort to improve my own diet I prefer to use a butter and olive oil or canola oil mixture on my toast . . . plus jam. For those who like a little more unusual taste . . . one of my favorite little restaurants on Capitol Hill in Seattle has crocks of liquor with figs in them. In case you don't want to eat figs or fig jam on toast, you can make a toast to figs. The following video explains about the care of fig trees across the United States.